left to right: Prof Laurette Pretorius, Delyth Prys, Prof Lesiba Teffo, Dr Tegau Andrews, Prof Phalandwa MulaudziDelyth Prys and Tegau Andrews spent a week in Pretoria, South Africa, at the invitation of the Academy of African Languages and Science at the University of South Africa (UNISA) College of Graduate Studies. 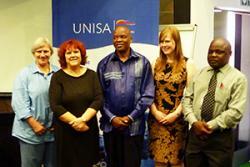 UNISA delivers distance learning to around 300,000 students. Many of these come from rural and/or deprived background, and would not otherwise be able to afford a university education. English is at present the main medium of teaching, but recent studies have shown that this is the second or third language of the majority of students, and efforts are now being made to improve teaching and learning by introducing adequate high-quality study and support materials in the students' home languages. South Africa has 11 official languages, with English the home language of only 9.6% of the population, so this is quite a challenge. UNISA has a large and vigorous translation unit consisting of 40 translators, covering four of the largest official South African languages so far. They had already been active on the terminology front, with extensive collections of term lists in many languages. "We were impressed by their commitment to develop multilingual resources for their staff and students, and by the amount of work already undertaken. Our contribution was to look at collaborative work systems to facilitate standardization and dissemination of multilingual terminology, and to help them move from paper-based publication to faster and more economic digital methods. As such our server-based Maes T terminology development system, which allows a dispersed team of terminologists, linguists and subject specialists to develop terms, was ideal to their needs, and we now intend to share it with UNISA, and to develop it further with the help of their own software developers. We will also share with them the code behind our Welsh National Terminology Portal, which will allow them to publish terms on-line at the click of a button, once they have been processed in Maes T". "We were surprised at how similar the issues were in dealing with academic terms in Wales and South Africa, despite the differences in our linguistic environments. In both cases the academics are our subject specialists, and their contribution to the standardization process is paramount. In Wales collaboration across Welsh universities has been facilitated by the advent of the Coleg Cymraeg, and the terminology work has benefited from the sharing of expertise across institutions, and the placing of resources on the Coleg's resource portal, Y Porth. We were encouraged by the emerging collaboration between South African universities, especially since representatives from institutions across South Africa had travelled to be present in our workshops". "We hope this new impetus to standardize and disseminate multilingual academic terminology will make an impact on widening access to higher education for some of our most deprived students. It is good to hear of the experiences of higher education in Wales, and there is much we can learn from each other." "We hope that this is just the beginning of a long and fruitful collaboration with Bangor University. We would now like to arrange further visits between our institutions, and are working on a joint grant proposal to enable us to strengthen our ability to work together".